Find artworks, auction results, sale prices and pictures of Fortunato Depero at auctions worldwide. Fortunato Depero* (Fondo/Trient 1892 - 1960 Rovereto) Lettrice e ricamatrice automatiche (Mecanical female reader and embroiderer), 1921/22 oil on canvas; 75 x 100 cm signed on the lower right: F. Depero (later, approx. 1924-26) Provenance private collection, Austria Literature cf. Depero futurista, exhibition catalogue Palazzo Bricherasio, Turin 2004, p. 63; cf. 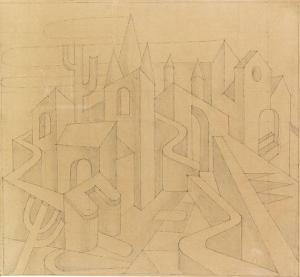 Maurizio Scudiero, Depero. L'uomo e l'artista, Monografie, 2009, p. 219 The work has been registered "Archivio unico per il catalogo delle opere futuriste di Fortunato Depero" under the Archiv-no. FD-0542-DIP. Confirmation by Maurizio Scudiero, Rovereto, 26 February 2018, is enclosed. Sale 2469 Lot 544 FORTUNATO DEPERO New York. Gouache on board, 1930. 375x315 mm; 14 5/8x12 1/2 inches. Signed, titled and dated in gouache, upper left recto. Ex-collection Galleria Carli, Bolzano, with the gallery label, verso; private collection. 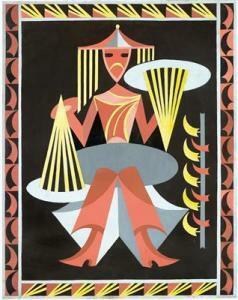 Depero (1892-1960) began his artistic career as a participant in the Italian Futurist movement. In 1915, he published the Futurist Manifesto of the Universe with fellow artist Giacomo Balla (1871-1958). In his paintings, Depero depicted mechanical, vegetal and animal forms using large, flat areas of bright color. 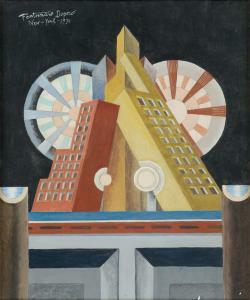 The current lot was created during Depero's brief but creatively significant stint in New York, from 1928-32. In New York, Depero gave solo exhibitions and found success through his work in stage design, advertising and graphic design. He also designed some covers for magazines such as Vogue, Vanity Fair and The New Yorker, among others, forging a unique style which blended Futurism with Art Deco flourishes. Fortunato Depero 1892 - 1960 Paesaggio. 1951. Tusche über Bleistift. Rechts unten mit Bleistift monogrammiert. Auf bräunlichem, glattem Papier, fest auf Leinwand montiert. 104,5 x 113,5 cm (41,1 x 44,6 in). Bitte beachten Sie den Zustandsbericht im Internet. Mit einer von der Frau des Künstlers bestätigten Fotografie (in Kopie vorliegend). PROVENIENZ: Rosetta Depero. Privatsammlung Italien. AUSSTELLUNG: Depero 50, Studio 53 Arte, Rovereto, 30.1.-31.5.2009. Fortunato Depero zählt zu den führenden Futuristen Italiens. 1919 eröffnet er ein futuristisches Kunsthaus in Rovereto. Neben seiner Tätigkeit als Maler und Bildhauer fertigt er auch Entwürfe für Bühnenbilder und das Kunsthandwerk. Die noch heute gebräuchliche konische, kleine Campari-Soda-Flasche geht auf seinen Entwurf zurück. Aufrufzeit: 07.12.2017 - ca. 17.33 h +/- 20 Min. Dieses Objekt wird regel- oder differenzbesteuert angeboten. ENGLISH VERSION Fortunato Depero 1892 - 1960 Paesaggio. 1951. India Ink over pencil. Monogrammed in pencil in lower right. On smooth brownish paper, firmly mounted on canvas. 104.5 x 113.5 cm (41.1 x 44.6 in). Please note the online condition report. With a photograph that has been confirmed by the artist's wife (in copy). 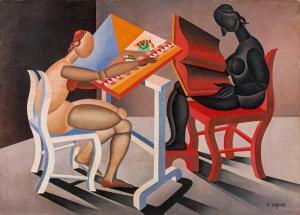 PROVENANCE: Rosetta Depero Private collection Italy. EXHIBITION: Depero 50, Studio 53 Arte, Rovereto, 30 January - 31 May 2009. Called up: December 7, 2017 - ca. 17.33 h +/- 20 min. This lot can be purchased subject to differential or regular taxation.